The Stranger is generally regarded by Orson Welles aficionados as a standard thriller done for money, undertaken to prove to studio executives that he could work within the system (it had been four years since his last directorial effort). He even said as much in interviews, and criticised the studio for cutting approximately 30 minutes from the beginning of the film that he wrote himself (1). Admittedly, The Stranger is not in the same league as, say, Touch of Evil (1958), but the film does have its merits. It is a tightly-plotted and well-acted thriller that bears Welles’ unique stamp, in spite of it being a director-for-hire project. An investigator named Wilson releases Konrad Meinike (Konstantin Shayne) – a convicted Nazi war criminal – from prison, hoping that he will lead him to an even bigger fugitive, the notorious Franz Kindler (Orson Welles) (2). Sure enough, Meinike finds Kindler posing as Charles Rankin, a history teacher in the idyllic small town of Harper, Connecticut. There is a certain delicious irony that a notorious Nazi war criminal is not only teaching world history to America’s privileged elite, but that he is also marrying the daughter (Loretta Young) of a Supreme Court judge (Philip Merivale). The film plays out as an entertaining cat-and-mouse game, with Wilson applying pressure on Kindler to reveal his true identity. Many Welles supporters complain that The Stranger lacks the overt stylistic flourishes of his more celebrated efforts, such as The Lady from Shanghai (1947) and Othello (1952). 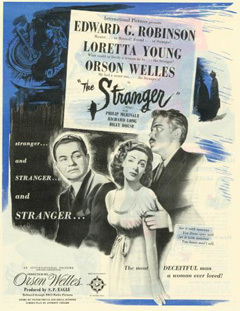 While it is true that his trademark style is more restrained in The Stranger, it is still recognisable as a Welles film. For example, the opening sequence – where Meinike is released from prison – features the use of German Expressionistic lighting (in particular, the use of silhouettes) that Welles used so effectively in Citizen Kane (1941). After Meinike and Wilson arrive in Connecticut, Welles uses a swooping high-angle establishing shot to give a God’s-eye-view that anticipates a similar shot at the beginning of Touch of Evil (both films were shot by Russell Metty). Welles also utilises low-angle shots (used effectively in Kane) in a school gymnasium when Meinike gets the upper hand on Wilson. Welles’ love of long-takes is also evident in The Stranger during a four-minute scene between Meinike and Kindler in the woods. This leads into one of the best sequences of the film, in which Kindler frantically covers up a dead body in the woods, while several of his students are participating in a paper-chase nearby. The use of dramatic music and Welles’ panicked, paranoid facial expressions create palpable tension in this scene as the teacher is almost caught by his pupils. Welles is not only able to wring tension out of action sequences but also through dialogue-driven scenes as well. At one point during the film, Wilson and Kindler meet face to face over a family dinner. Kindler delivers a chilling monologue that starts off cordially and then, as he lets the façade slip ever so slightly, he expounds on Germany and the Nazi philosophy. He claims that the Germans are not waiting for another Messiah a la Jesus but rather another Hitler. It is a powerful speech delivered with zeal by Welles (who relished playing villains) that anticipates his famous monologue in The Third Man (Carol Reed, 1949). The looks that Welles and Robinson exchange during this scene make it clear that the two men have no illusions about who they really are – but proper dinner decorum keeps them in check during the meal. It is what is not being said that is just as telling as what is being said. Story-wise, The Stranger lacks originality. It is essentially a reworking of Alfred Hitchcock’s Shadow of a Doubt (1943), with Uncle Charlie being substituted by Franz Kindler. Both films are set in postcard perfect small-town America, feature the villain launching into a psychotic monologue while sitting at a family dinner-table, and climax with a dramatic scene atop a bell tower. Edward G. Robinson also seems to be channelling his cranky investigator from Double Indemnity (Billy Wilder, 1944), and in doing so instils a methodical intelligence in his stereotypical character. Welles completed The Stranger under budget and on time. It was released in May of 1946 and performed quite well at the box-office, earning an Academy Award nomination for, ironically, Best Original Screenplay. More importantly, it proved to Hollywood that Welles was a bankable director, and paved the way for his next film, The Lady from Shanghai. Even though Welles disowned The Stranger, it still contains enough of his personal touches and pre-occupations to elevate it above the generic thriller, to a movie that belongs alongside his other artistic successes. The 30 minutes of footage that was cut featured a large chase between Wilson and Meinike as he tried to locate Kindler in Argentina. Producer Sam Spiegel ordered the film’s editor to cut this footage because he felt that it did not advance the story. Welles originally wanted Agnes Moorehead to play the role of the investigator but was overruled by the studio. J.D. Lafrance, a film critic from Canada, is currently researching and writing a book on the films of Michael Mann.